April showers have finally arrived and our rain barrels are already both at capacity. It has not even rained that much but between the two barrels they collect over half the rain that falls on our roof, and that adds up to enough collected water to fill up our two barrels. The last few rain showers we have had not been major, less than a couple inches total. Even so, I’ve noticed the water flowing out of the overflow valves on our barrels. Seeing all this rain water leave our barrels made me realize that it was time we started utilizing this water more effectively. Originally we thought we’d just be using the collected rain to water our plants and garden. During the spring when it is raining a lot the barrels are filled up quickly and the garden does not need watering because the rain takes care of that for us. That just left a couple gallons a week used on our indoor plants, hardly making a dent in the 60 gallon rain barrel capacity. One of our Facebook page fans (we no longer use Facebook) suggested several uses for the water that we decided to give a try. The ideas were to use the water to flush toilets, wash laundry, and water plants. We’d already been using the water for our plants but the other two ideas we needed to test out. The first idea of flushing toilets was something we have already been doing with collected shower water in our master bathroom. To do this we place a bucket under the main water faucet and let the water run into the bucket as it is heating up. 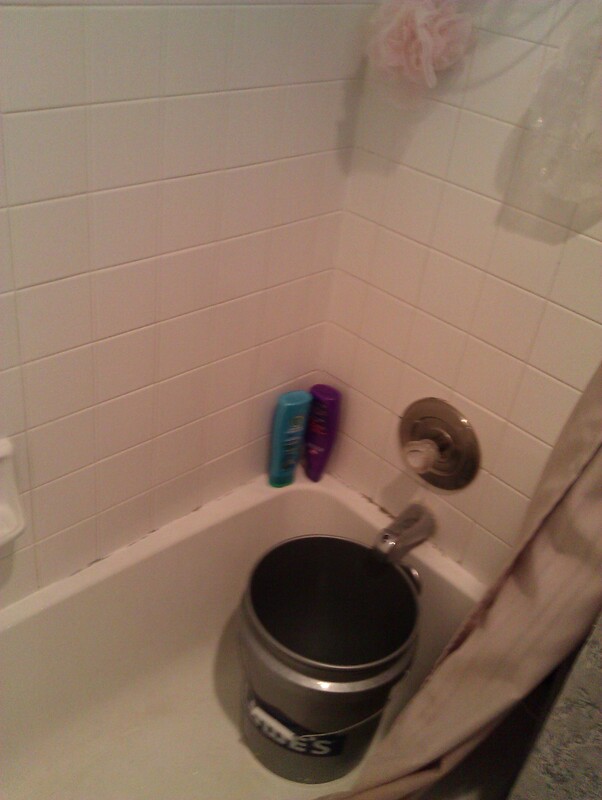 Once the water is warm enough to shower, just slide the bucket to the back of the tub and start your washing! This water is normally just wasted because we don’t get right in and start showering when the water is still cold. The collected shower water in the bucket is very convenient to then use to flush the toilet. We’ve found that if you pour carefully you can get about two full flushes from one 5 gallon bucket. If you over pour it results in extra water being flushed and subsequently wasted. To use water from our rain barrels to flush toilets means we get a little bit of a workout. We don’t currently have a bathroom in our lower level floor that opens up to where our rain barrels are located, this means that in order to use the water in our bathrooms we have to haul buckets of water upstairs! We already have water buckets from our shower in our top floor so we only had to go up one flight of stairs to ensure buckets of recycled water are available on each floor. We are not militant about always using the recycled water to flush since its not really saving a significant amount of money. But if we notice the bucket is getting low we try to make a quick trip to refill it so there is recycled water available to use. We will continue doing this because its just something that we can do to reduce our impact, save a small amount of money, and get a good workout hauling buckets of water! A side benefit is that it does help prepare us in case there is a time when we don’t have running water available so we already have a system in place that allows us enjoy some extra comforts using free natural resources. The next idea was a new one for us, using the rain water to wash our laundry. This idea has turned out to be quite convenient for us as our washing machine is located in our lower level so we don’t have to haul buckets of water up any stairs to get the water from our rain barrels to the washer. To wash our laundry with the rain water we really are just using the recycled water for the first cycle. We start by putting the detergent in the washing machine then proceed to fill it up with water from the rain barrels. It takes several trips with the 5 gallon buckets to fill up the washer, so its a great way to use up a bunch of collected rain water. 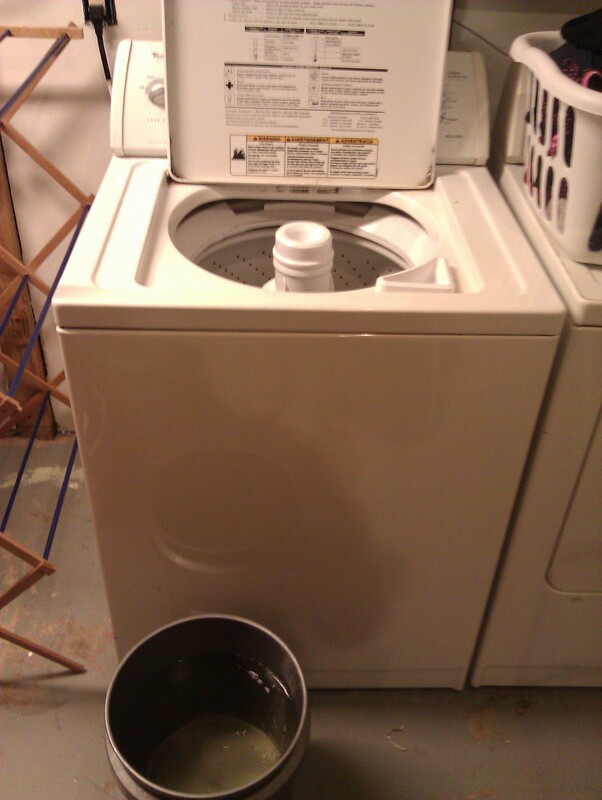 Once the water is about 3/4 full I turn on the washer and load up the clothes. The water from the washer will run for a little bit but then it starts with the wash cycle, saving us around 15-20 gallons of water! Today I was working out in the yard and noticed it was starting to rain. I knew the barrels were pretty full still, so had an idea related to using the rain water for laundry. The washing machine turns the drain off after it is finished running. This allows you to use the washing machine to store water for itself! 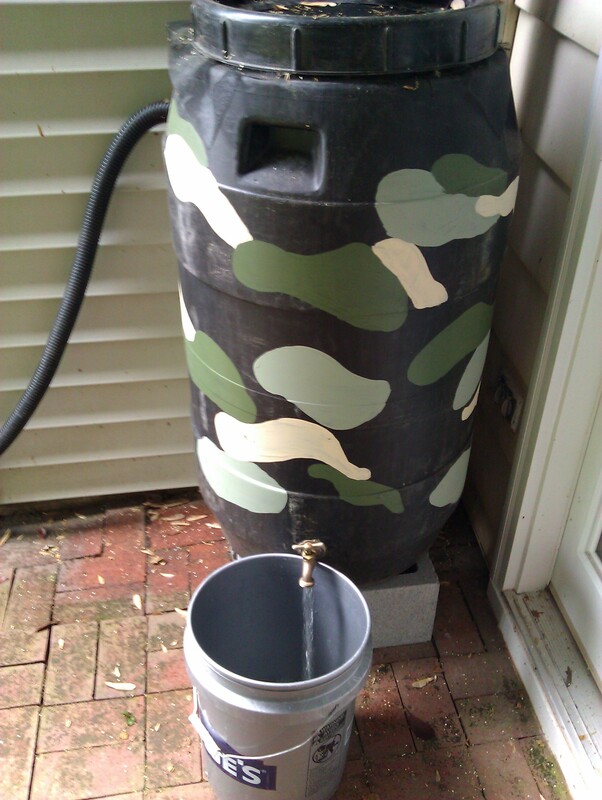 So even if you are not planning on doing laundry immediately, if you know you’ve got some extra water in the rain barrels and its about to rain, why not take a couple minutes and fill up the washer so its all ready to go next time you want to do laundry? 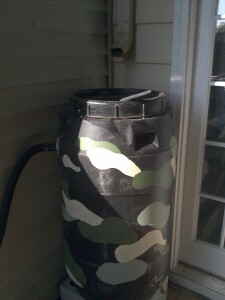 It will also give your barrels some extra capacity for the the coming rain! How do you recycle water in your homestead? Do you have any other interesting ideas for using the water you collect?